So begins the opening number of the new musical Something Rotten, and what a welcome it is. For the first time ever, we found ourselves in the audience of a show just after its Broadway opening, which felt rather special. 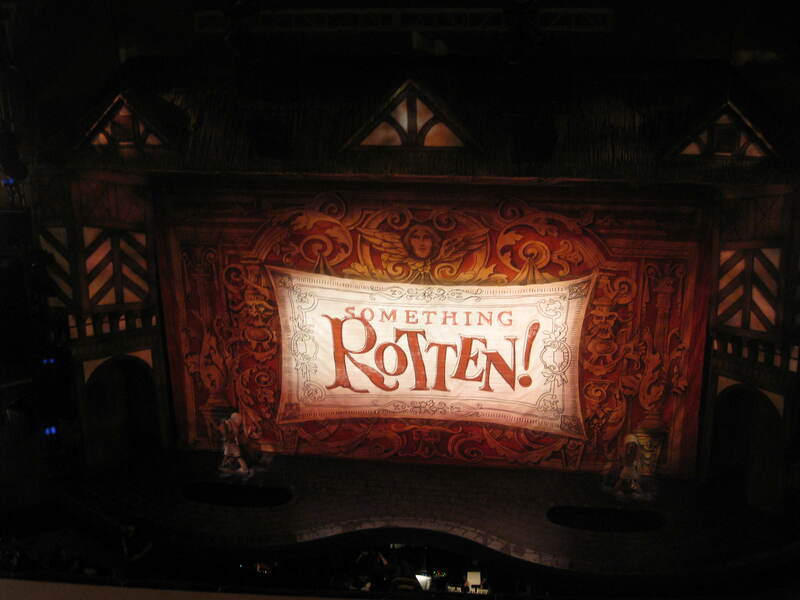 Something Rotten has been in previews for some time and a number of our friends have seen it and raved about it, so when my cousin mentioned getting tickets for something when she was in town we knew exactly what to suggest. A clever Olde Englishe set provided the backdrop to the tale of two playwright brothers, Nick and Nigel Bottom, struggling to write a hit against the rock-star talents of one W. Shakespeare. In desperation, Nick consults a soothsayer for advice, and learns of a wondrous new theatrical form called the Musical. Cue a song-and-dance number incorporating snatches of and references to all the hit musicals you can think of, much to the delight of the audience (many of whom had clearly seen far more shows than we have). Although the whole thing was really very silly indeed, the dialogue was witty, clever, and cram-packed with Shakespearean references as well as Broadway ones (I felt rather smug for noticing that members of the Bottoms’ theatrical troupe were named after the mechanicals from A Midsummer Night’s Dream). Shakespeare himself was played wonderfully by Christian Borle, in a manner reminiscent of a younger Tim Curry and with the same glorious accent (we noted from the program that Borle previously appeared in Spamalot with Curry – coincidence?!). In fact the accents were the only tiny sour note in the whole piece for me – other than Borle everyone else stuck with their American accents, which made the word “Renaissance” particularly grating. I probably wouldn’t have noticed this but for A Gentleman’s Guide to Love and Murder, as that cast were excellently English-sounding. Anyway, other than that very minor gripe, we had a wonderful time, and I’m looking forward to when they release the recording to see if I can spot more of the references I missed the first time round! We’d also love to see it again, but as the opening reviews have generally been excellent, and it’s got a couple of Tony Award nominations, I’m predicting that tickets will be scarce for a while. This entry was posted in Music and tagged Broadway, musicals by Emma Davidson. Bookmark the permalink.